A song, a hymn, or a reminder as to who our customers are? Who do we serve and why is that important? 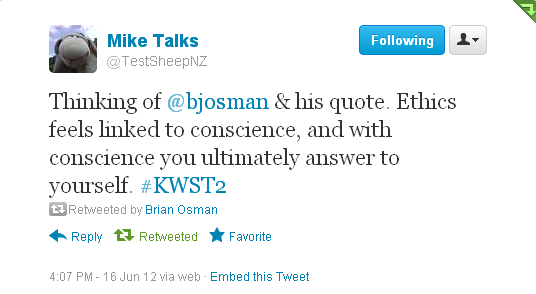 During KWST#2 (June 2012, Wellington, New Zealand), the discussion about whom we serve came up. Whom shall I serve? I think first and foremost it is ourselves. We are responsible for our own work, for our own ethics, our output, our own learning, our own interactions with others, our own interactions with other testers and our own interactions with the software testing community. Sometimes we take a high degree of responsibility for one or some of these things and sometimes we don’t. What may be important is that we come to understand that we also serve ourselves and by seeing ourselves as a customer (if you will) then it allows us to appreciate who we are as a tester, what we can deliver, what skills we have and what we stand for. Too often I have seen testers wilt in the face of criticism (and scrutiny for that matter) from management attempting to justify testing or test artifacts or activities. Knowing what we stand for gives us a moral ground to argue from. Unfortunately, it doesn’t mean that everything will be *perfect* because we are conscious of our position but at least we know our tipping point. So how do you deal when reaching your tipping point? So, whom do we serve? Ourselves first (it’s not as selfish as it may seem) and then those mentioned above. Putting ourselves first means that we are taking responsibility for the quality of our own work which means in turn, we are better placed to serve our customers.